"Another World So Very Close"
Situated only 105 miles off the coast of Florida, Cuba has been a mystery to Americans since 1960 when the United States imposed a severe trade embargo against Cuba. The Blockade was created after Cuba nationalized American-owned oil refineries without compensation. As part of this embargo, travel to Cuba by Americans has been restricted for over half a century. This embargo was eased greatly by President Obama. As of January 16th, 2015, Americans no longer needed to pre-apply for specific licenses to visit Cuba if they fit one of the 12 special categories. It simplified the process for Americans that meet those special requirements to visit Cuba. That year the two countries exchanged Ambassadors for the first time since the 50’s. As of November 8, 2017 the Trump administration put in place measures aimed at channeling economic activity away from the Cuban government/military. Their stated goal is to encourage the government to move toward greater political and economic freedom for the Cuban people. Under the new directives, Americans are forbidden from doing business with entities on a State Department list headed by the Cuban defense and interior ministries. On the list are five major holding companies with ties to Raul Castro's government or military, and which between them control much of the organized tourism sector. The list goes on to name dozens of major hotels in Havana and several resorts, including the brand new Manzana Kempinski, which opened with great fanfare this year as Cuba's first to meet the international five-star standard. Also included are five Caribbean marinas, ten stores in touristy Old Havana and industries serving the military. Two rum distilleries are on the list, along with a shopping mall, a photo developer and a real estate broker. Americans still seeking to travel to Cuba will only be allowed to do so on educational trips and “People to People” excursions organized by a US firm and with a guide. 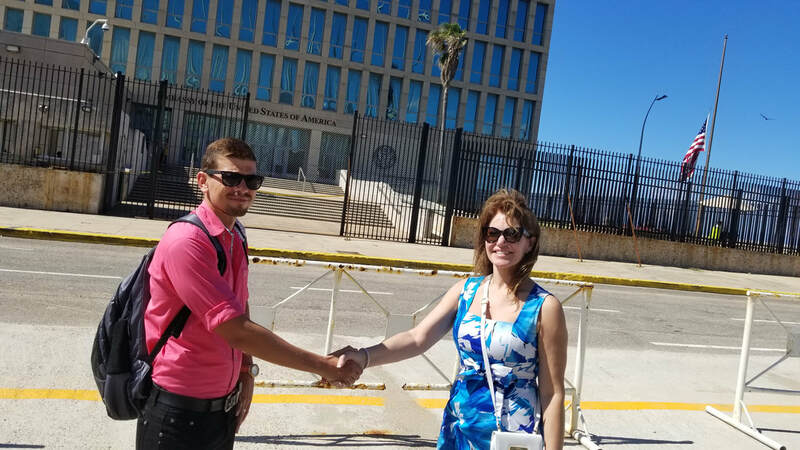 Those traveling to support Cuba's people must have a daylong schedule of activities designed to expose them to Cubans and steer dollars toward citizens. Included in this type of sanctioned travel are cruise ships. Today there are airlines that travel to Cuba. At the time of this writing there were multiple flights from Washington, DC to five cities in Cuba ranging from $410 to $540 roundtrip. If traveling by air a Visa will need to be purchased at the check in counter (or while waiting in line) before your flight. The visa is a separate card you keep with your passport, but it’s not attached. The easiest way to get to Cuba is to take a cruise ship to Havana. Currently Royal Caribbean and Norwegian have weekly stops in Cuba. Until just recently Royal even offered an overnight so you could experience the legendary Tropicana Night Club. Virgin Cruise lines, launching in 2020, already has Cuba on its list of itineraries. If traveling by ship, they will give you the appropriate form to fill out for your Visa at embarkation. Credit & debit cards issued by American banks still don’t work in Cuba. So a trip to the island involves bringing cash. Then when you are on the island, plan on exchanging it at the exchange stations throughout or at banks. There’s an official currency exchange outside the airport in Havana which is your best bet. Most of the markets, taxis, and other retailers will hastily take American cash without the safety net of an exchange system in place. I ended up paying about $3.50 for a bottled water this way. Hotels & resorts are available in the most popular tourist cities like Havana, Trinidad, and Varadero. They can be booked on line. But, don’t expect American standard hotels though. I am told that what we consider modest is considered luxury in Cuba. If you want to travel on a budget then look to a “casa particular”. It is like a homestay or guesthouse in someone’s home. They sometimes include breakfast and run between $20 – $30 per night for a double room. To operate a casa particular, local families need to register & pay special taxes to the Cuban government. Most casa’s don’t have websites, so you just walk around and ask about availability when you get there. If one is booked, the owner will usually help you find another nearby. AirBnB is now operating in Cuba too! Renting a car in Cuba isn’t easy or inexpensive. There aren’t many vehicles available yet, so you generally have to book a car at least 2 weeks in advance by calling or emailing the car rental company. Renting a car in Cuba with insurance is going to cost you between $70 – $90 USD per day. There is also a cash deposit required. Simply feeling the ride in these antique autos- many of which are convertibles—is worth the investment. 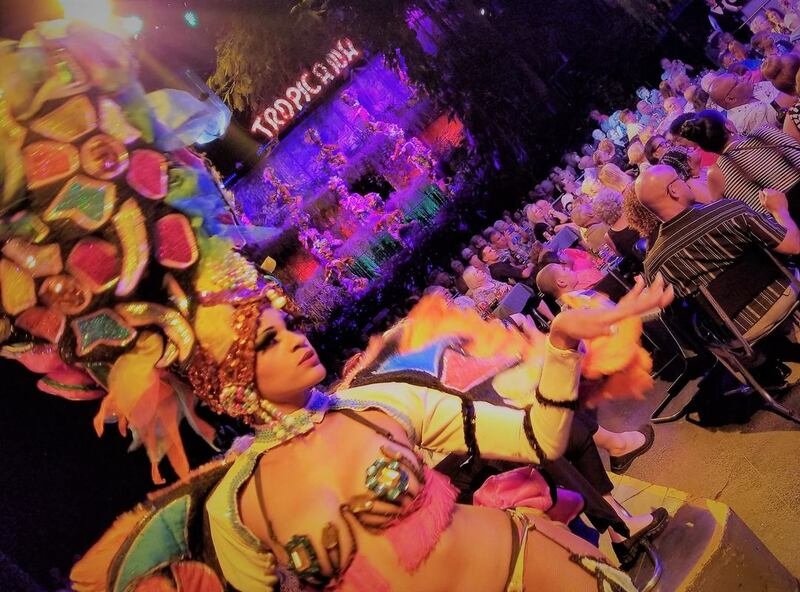 The Tropicana night club is a must see when in Cuba. It has been operating since 1939 with a feast for the senses. There are literally hundreds of dancers, all fit and beautiful, with bright colored costumes that would rival any Broadway show. There are multiple stages going simultaneously so there is always something delicious to look at. It cost about $150 per person US. I would also recommend having diner before the show at the Tropicana. It was delicious and fun. Tap water in Cuba is not safe to drink, and bottled water can sometimes be difficult to find depending on where you are. If you plan on traveling to Cuba, I recommend drinking soda without ice cubes, bottled water or alcohol. If you are traveling to Cuba you are now allowed to bring back $400 worth of souvenirs, including $100 worth of cigars per person. And the cigars are available everywhere! To make sure that you are not getting banana leaves or inferior tobacco though we recommend you seek out the state sanctioned cigar shops. They will not limit you on how much you buy but you will not be asked at Border Control how much you brought back. Our bags were not checked but they could have been and we would have been subject to all laws. This year I was fortunate to travel twice to Cuba; once in May and again in November. I found it charming. The people are warm and really want you to fall in love with their country. But it is like stepping back into the sixties. The cars and houses especially have stayed frozen in time. It is definitely worth a little inconvenience to get away to another world so very close to us.